We can build any length Pontoon Boat from 16-26+ ft with whatever you want: HOT TUB, deck, flooring, fence/rail, motor pods, steering consoles, raised front deck or cabin for better big wave handling like the EcoCruiser.net boat that got us into this. We build Stable, Portable Docks or TINY HOUSEBOATS WITH NO PERMIT FEES OR DELAYS. 8-12 ft wide, 16-25 ft long with pontoons in stock or custom docks in any dimension. COMMERCIAL MOBILE PLATFORMS FOR WATERFRONT WORK BARGES OR HAULING. Prices start at $3350 for 16-18 ft pontoons. Contact us for a quote of what you want with options. We have 16,18,19,20,21,22, and 25 ft pontoons in stock now. Custom sizes available. 23",25" and 27" diameter are with .090 wall thickness and up to 8' sections. Pictures show most of deck bracing installed on the 25 footer. I have the remaining x-members and will install before sale. 0.090" thickness aluminum is normal gauge for this size pontoons. Built by professional pontoon company in Minnesota--quality construction and welds. Can have live/well pump/depth-fish finder tabs on back. 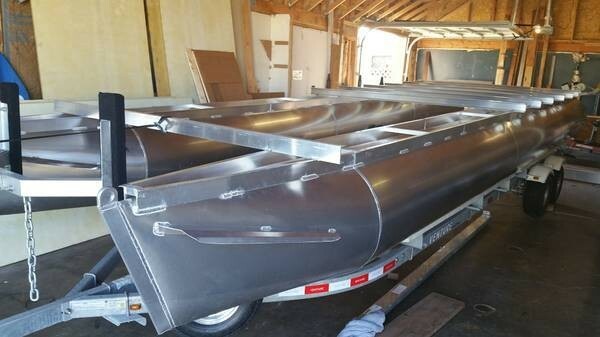 2016 Venture Galvanized Pontoon Trailer with 4 disk brakes. 5,200# boat weight capacity $3950 includes pvc bunk covers, led lights, spare tire and mount, side guides, Load range E 20x10 low profile tires. We have built more than 8 so far. Along with other boat building projects. Our first pontoon built from scratch was in 2003 for my family, the first prototype EcoCruiser.